Testing the amp module, seems to work fine! I’ve been meaning to build a FM receiver for a long while now, but the fact of the matter is I’m still without a scope, so anything audio or radio-frequency related is rather hard to work on; since I’m technically blind and troubleshooting takes twice as long, if not more. Either way there’s no point in waiting for that opportunity to come, so I’ll just start working on the receiver and see where I get to. After doing some research I came to the conclusion that a proper receiver would be too complicated at this stage, but then I stumbled upon slope detection. Turns out the audio quality is awful but at least it’s a starting point! — It means I can get things done for the time being. First things first, the amp stage — I wanted a flexible mono amplifier and I found what I think is the simplest circuit out there – without getting into power amp ICs – It’s basically a push-pull configuration with one input stage and nothing else to it. 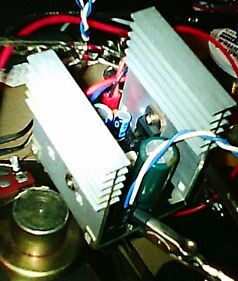 I modified the amp to support a wide range of input voltages, amplitudes and loads. It sounds a bit flat, but it’s good enough for a radio. I might add a bass-boost switch in the future. I’ve yet to try this tiny amp with inputs higher than 12V, it should handle 48V with no problems! — at 12V though the speaker never sees more than ~1.2W if it’s lucky. However for a radio that’s usually more than enough. I’ll be posting the final schematics once I start working on the actual receiver module.